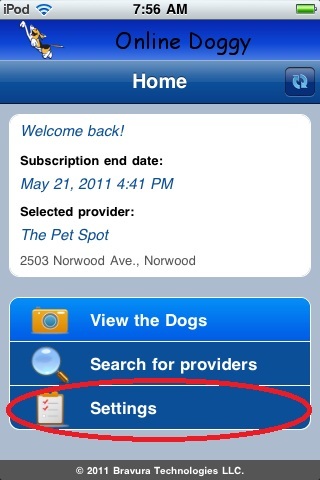 The best thing to do is delete the ODoggy App from your IOS device and reinstall it. To delete it, hold your finger on the ODoggy App icon for three seconds, then press the black x. Once you reinstall ODoggy, it will remember your subscription and you should now be able to select a provider and View the Dogs. After you reinstall open the ODoggy app, select Settings then select Use this Device. 2. How do I turn off the Auto Renewal for my subscription? 4. 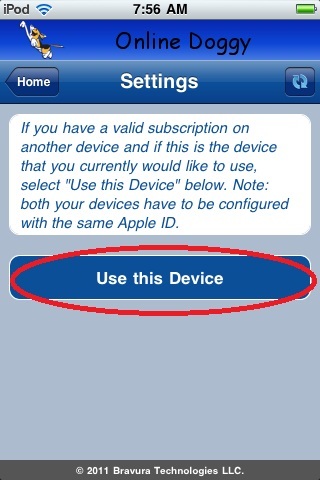 Select 'View Apple ID' and sign in if prompted. Please keep in mind that iTunes controls your subscription. We cannot turn off auto-renewal because of this, so if you are having issues turning it off please contact Apple directly. 3. If I have more than one device (iPhone, iPad, iTouch) connected to my iTunes account, do I have to pay a subscription for each device? 4. I have tried searching for my Pet Care Provider, and they do no show up in the search results. Do not fill in all the fields on the search page. If the information you input does not exactly match our database, it will not return your provider. To keep it simple, try searching by State only. That will get you to your Pet Care Provider. 6. I Have iPad with iOS 6.0 or higher. When I search the App Store for ODoggy, I get No Results Found.